In Winning, their 2005 international bestseller, Jack and Suzy Welch created a rare document, both a philosophical treatise on fundamental business practices and a gritty how-to manual, all of it delivered with Jack's trademark candor and can-do optimism. It seemed as if "no other management book," in the words of legendary investor Warren E. Buffett, would "ever be needed." Instead, Winning uncovered an insatiable thirst to talk about work. Since the book's publication, the Welches have received literally thousands of questions from college students and seasoned professionals alike, on subjects ranging from leadership and global competition to tough bosses and building teamwork. Indeed, questions about virtually every business and career challenge have poured in—some familiar, others surprising, many urgent and probing, and all of them powerfully real. 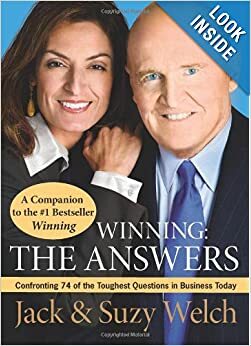 Winning: The Answers takes on the most relevant of these questions, and in doing so, its candid, hard-hitting responses expand and extend the conversation Jack and Suzy Welch began with Winning. It is a dialogue that is sure to be both compelling and immensely useful to anyone and everyone engaged in the vital work of helping an organization grow and thrive.